Two posts in a row.. I must be on a roll! That and I was kind of excited to share these gems with you all! Last night I was desperately seeking inspiration, so I decided to just search 'nail art' via tumblr. 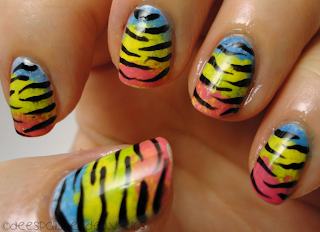 Found a few other awesome photos for inspiration, but a colourful zebra manicure caught my eye the most. I knew it was what I wanted to do, colourwise, etc, but I didn't want 'stripes' of colour.. I wanted some sponge action.. Done & done! I apologize for my nails being greasy looking. For whatever reason, my cuticles have been 100% super dry lately.. This leads to me picking at them constantly and them being even worse. Today, after work, they were grossly dry and I started picking.. So I decided to slap on some cuticle oil.. Then I figured I better snap some photos as I already have some signs of tip wear.. And I was doing easier work today.. That is my only complaint with sponging.. It looks incredible, but it always wears so quick! I didn't snap a photo of what I used (sorry, I was overly excited to post this up!! ), but I will tell you.. I mean, you've seen most of these bottles a time or three on my blog anyways! I started with a base of Seche Vite Porcelain (I was practicing a French Manicure before actually doing my own nails - so it was handy! ), I followed that with the sponging of: OPI No Room For The Blues, Zoya Pippa, OPI Who The Shrek Are You? & CG Rich & Famous. Once the sponging was done, I striped on some CG Liquid Leather with my trusty little brush. I am kind of in love with my nails right now. Not only do I really like this, I am really enjoying the length they are at.. They will be monsters within another week.. Sigh! I hope everyone is having a great weekend thus far! It is barely after 6:30pm and I am seriously contemplating bed.. So. Sad! 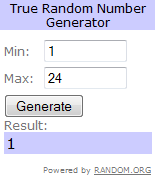 Again, thank you to all that entered! I am hoping to set a cap on a number (I am thinking 300.. It should take some time!!) and then I will hold my OWN contest.. Which means I should probably start collecting prizes asap here!